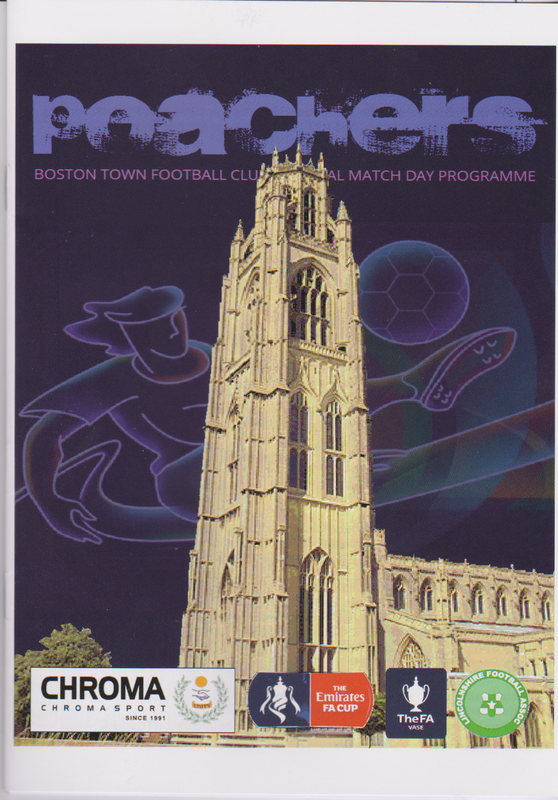 The club was formed in 1964 as BOSTON by ex-officials of the town's other club Boston United who were concerned that their club would go bust following financial troubles at York Street. They were renamed BOSTON TOWN in 1994. Initially they played in the Lincolnshire League before making the step up to the Eastern Counties League in 1966. The Midland League was their next stop and they stayed here until 1982, after being champions on 3 occasions. That year they became founder members of the Northern Counties East League but after 5 generally unsuccessful seasons here, they made the switch to the Central Midlands League, winning it's marvelously named 'Supreme Division' in 1988/99. The 1991/92 season saw them move again, this time to the United Counties League where they remain to this day. They've been in its top flight the entire time, winning the championship in in 1995 and 2001. They came close to winning it for a third time on 2007, only to lose out by 2 points to Deeping Rangers. They've struggled in recent years though, and only climbed out of the relegation zone on Saturday, thanks to a late equalizer in the 2-2 draw against Leicester Nirvana. As a result, they had a new manager Gary Frost who had come from Lincolnshire League Wyberton. In the FA Cup Boston Town have had a poor record in recent years, failing to progress past the 1st Qualifying Round since 1995. The 1976/77 season saw their best progress when they reached the 1st Round before losing 3-1 to Barnsley. The FA Trophy saw progression to the 2nd Round in 1979/80 before losing 6-3 to Mossley in a replay following a 0-0 draw in the first game. 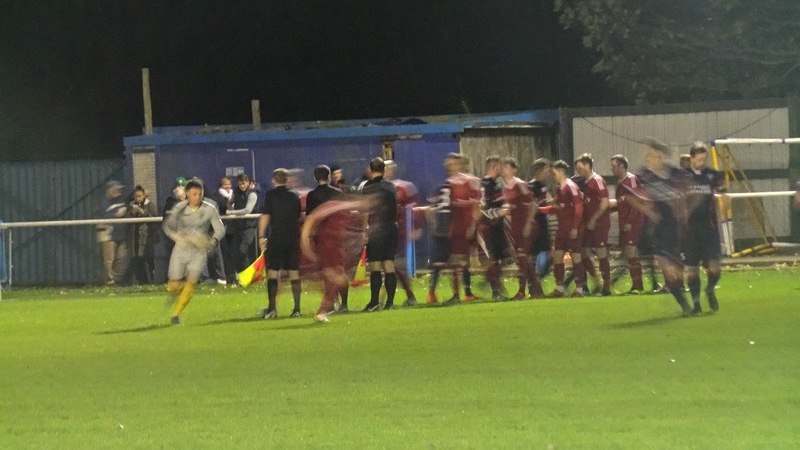 The FA Vase Semi Final was reached in 1994 before defeat to Taunton Town over a 2-legged semi-final. Local cup wins include the Lincolnshire Senior Trophy on 7 occasions and the Lincolnshire Senior B Cup in 1966. The club's record attendance of 2,700 came in a 1970 FA Cup 3rd Qualifying Round tie against cross-town rivals Boston United whilst the best ever win was 12-1 against Clay Cross Works in 1965. The club's record goalscorer is Gary Bull who scored 201 goals in a 7-year spell, including 51 goals in 2006/07. 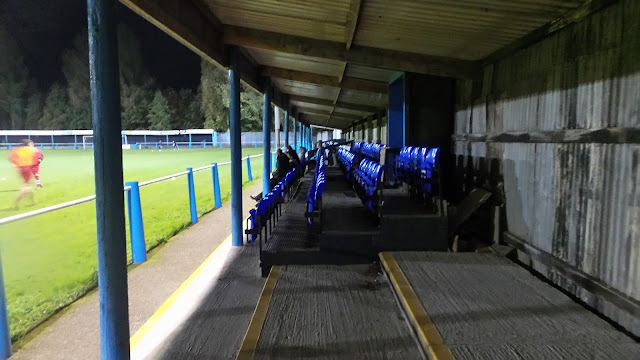 Our visit to this game was decided a week earlier when fellow hopper Chris and I were on the way to our game at Bilston Town. I'd got my copy of the Football Traveller, marking off all the possible games that we could go to on this day. There wasn't a huge amount of choice, and even less that was inspiring. 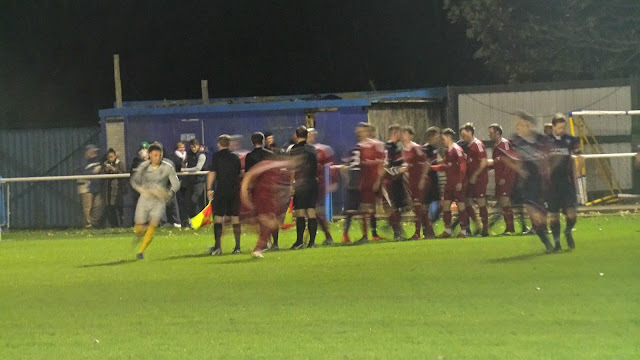 There was one that stuck out head and shoulders above the others though and that was Boston Town who were playing Wisbech Town in the United Counties League. 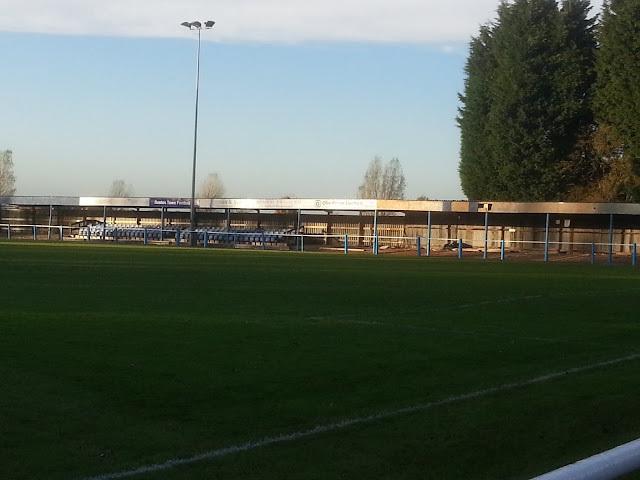 It was a ground that I'd been impressed with when I'd dropped in on my way to Gainsborough Trinity a few years back. We'd have to stop in Boston on the way though as the ground was a bit out of the way and didn't have many eating or drinking opportunities near it. On the day of the game I had a reasonable day at work, getting out at 12.15. My Football Traveller was there waiting for me on the doormat so I had a quick flick through and added a couple of fixtures to my list. 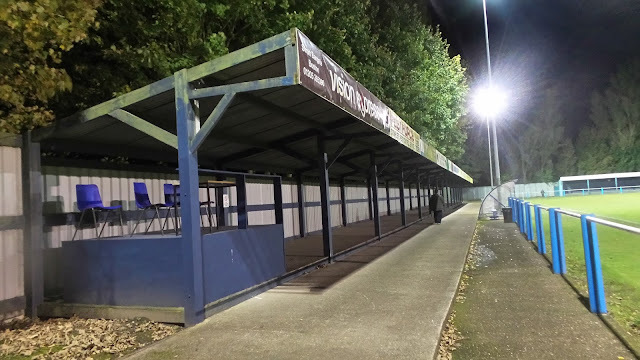 Marlow v Farnborough next Tuesday will be a revisit, but I need a cheap one with me having an expensive week coming up, plus an expensive month just passed. The start of that week, weather permitting will be Bootle v AFC Liverpool a week Friday. I'd booked a hotel a couple of miles from the ground for £45. I could have got it cheaper to be honest as there were rooms priced at £18, £29 and £35 but they had horrendous reviews. So I decided to bite the bullet and book myself something decent, rather than risk an uncomfortable night. With me spending around 45 minutes looking for a suitable room I didn't have time to upload last night's blog, but it was all but written up by the time I left at 3. I allowed an extra 10 minutes to get to Milton Keynes as I noticed the back route I used was scheduled to be closed for some time and I always like a rest to check my phone before I meet Chris. We left on time and made good progress, with Chris knowing all the back routes to avoid the traffic. On the way we decided that we'd be off to Kimberley Miners Welfare next week, as it was one that he'd wanted to do for a while. The only slow traffic we encountered was in Boston itself, with it taking 20 minutes to do the final half mile. We got to The Moon Under Water, the local Wetherspoons at 6.20, with me having a pint of Thatchers Gold and a Chilli Hot Dog. It was it's usual decent self and filled me up. After that we made our way to the ground, arriving at 7.10 and paying £6 entry plus £1 for a programme. After going round and taking pictures, we took a seat in the stand and waited for the game to start. 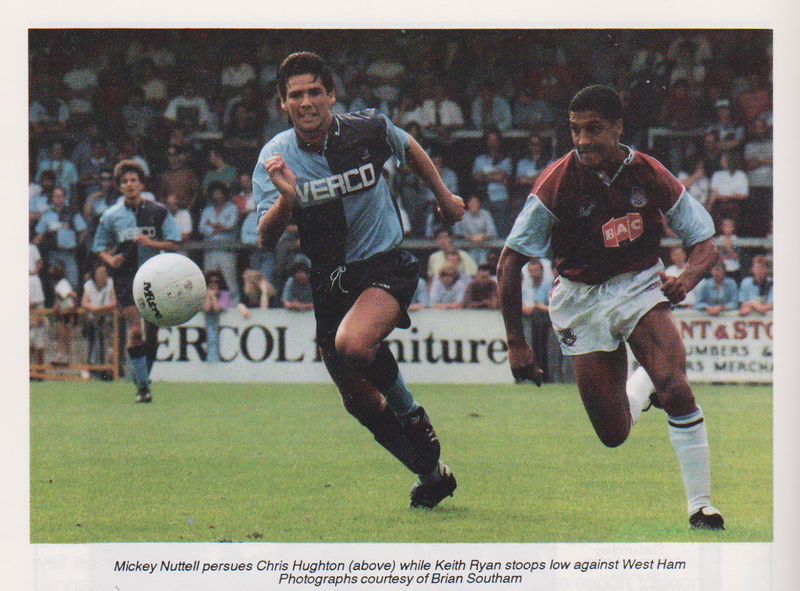 It was interesting to see that former Wycombe striker Mickey Nuttell was assistant manager at Boston Town. He was my first ever favourite player at Wycombe when I started watching them in 1991, having started the season on good goalscoring form and obviously impressing my 12-year-old self. Visitors Wisbech started much the brighter side and 20 minutes in they took the lead with Michael Frew dribbling around the keeper and finishing neatly in the bottom left hand corner. The visitors made it 2-0 around 5 minutes before half time. They'd dominated the first half and the goal had been coming for a long time, with only dogged defending keeping it at 1-0. It was a long range strike from Edgaras Buzas that went straight though the home keeper - a shame on him as he'd made some good saves previously to keep the score down. The second half died down a bit in terms of chances but the hosts did pull one back from the penalty spot on the hour with Fraser Bayliss netting following an infringement in the area. This really bought them confidence and from then on it was Boston with the lion's share of play. Alex Beck bundled home an equaliser on 87 minutes that had scarcely seemed likely half an hour earlier. 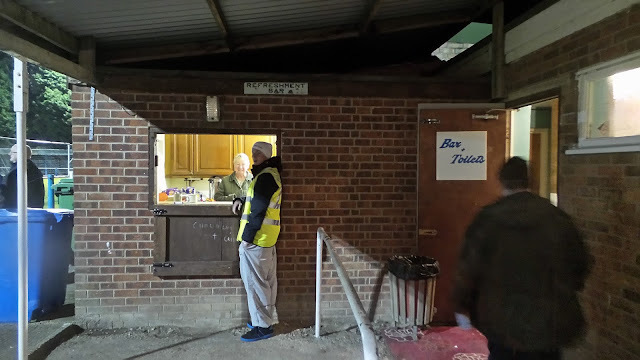 During the game, I'd been keeping an eye on Boston United's FA Youthful game with Kimberley Miners Welfare, mindful that potential extra time and penalties were a short drive away. I gave up early on when Boston shot into a 3 goal lead, but after the improbable comeback at my own game, I thought I'd best check. It turned out that Boston had won 9-0, so I set the sat-nav for MIlton Keynes and we were on our way. It was a very good journey back, and I dropped Chris off at 11.25, getting home myself at 12.10. I didn't get to sleep for ages after getting home though, which meant less than 3 hours sleep before my 4am start at work, but as ever I caught up the following afternoon. 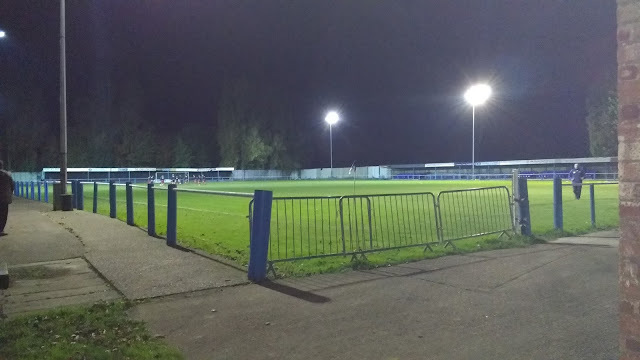 TATTERSHALL ROAD or the DWB STADIUM as it is known for sponsorship purposes is an outstanding ground for step 5 football and is easily good enough for step 2. I originally visited on the 12th November 2013 on the way to a game at Gainsborough Trinity. I was extremely impressed by a ground that had seating for 450 and cover on all 4 sides. The quoted covered capacity as 900, though it looks more than that. The ground is rated as having 5000 capacity, so I was looking forward to returning for a game in the future. On my revisit, apart from some seats being moved from behind the goal into the side stand, not a lot had changed and it was still very impressive. The entry and programme were good value at £6 and £1 respectively. 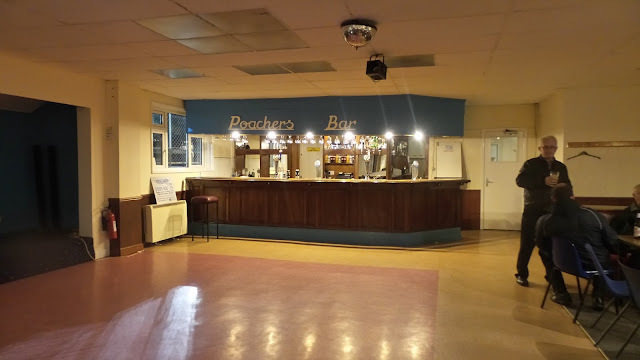 The tea bar and clubhouse were fairly basic, but they did the job. 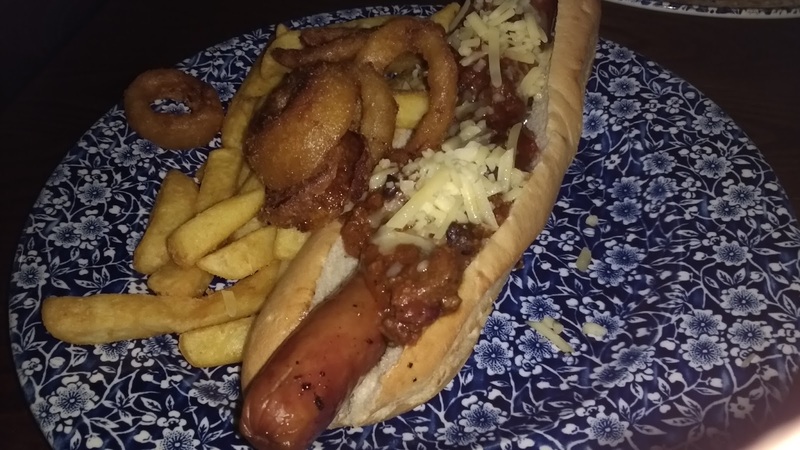 The town of Boston is around one and a half miles walk away and has a wide range of food and drink places and is probably your best bet for pre-match food and drink. So while it's true that the people make an event (and the people definitely made any event!) this space definitely adds a different dimension to it. Went to Chicago venues here for an evening event and I was really impressed.